Friday, March 21, was the spring equinox. This is when the sun is over the equator on its journey from south to north. The fall equinox is when the sun passes over the equator going back south. Here in Mayan land there are several phenomena that take place during this time. The Maya were well versed in math and astronomy. 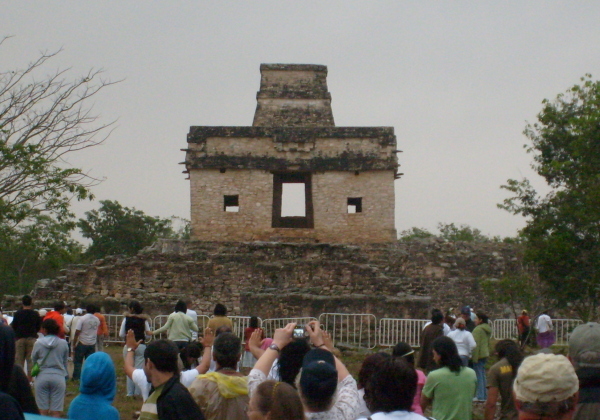 They built many of their important buildings to show something special on the equinoxes. While the weather did not cooperate throughout the day, we visited two of these sites yesterday. While we were still able to see some of the events of the day, we were not able to see it all. This is a Mayan town just north of the city of Mérida, where we live. has a temple that is situated so that when the sun comes up in the morning you are able to stand along a sac-be (main road) and see the sun rise perfectly centered through the doorway that is open in the front and back of the temple. Because the clouds were very thick, we were not able to see the sun come up through the temple door. We woke up at 4:00 for the event and left home about 4:40. We arrived at the site a little after 5:00 and knew that there would probably not be the show we were hoping for. While there were quite a few cars there already, it was not totally packed. I don’t know how many they were expecting, but anyone could have seen that it was going to be terribly overcast and a non-event before even leaving home. There were probably only a couple hundred people there. After the non-event which was supposed to take place around 6:15, we toured around the ruins. We went down a path that took us by some of the house structures and led us to the main part of the city. We were walking around in the ancient Mayan city by ourselves when a guard came and told us we had to leave that area because it was not open yet. He was very gruff and acted like we had broken some horrible law. There was nothing to indicate to us that we should not have been in that area. He made us walk back to where a group of people were standing waiting to get in. We stood there for about 30 seconds and then they opened the area. Whatever. The big event that we were excited about was seeing the Kulkulkán snake make its way down the steps of Chichén Itzá. This is a phenomenon where the 7 large steps at the Pyramid of Kulkulkán casts a shadow on the 91 step staircase causing the shape of a snake which terminates at the bottom of the staircase at the large serpent’s head. We got to the town about the time I anticipated, but I was very surprised by the amount of time it took for us to work our way to the parking lot and the ticket line. I dropped my group off somewhat near the entrance and they got in to stand in the ticket line. It took me about 30 minutes to park and get back to them. I got in line with them for tickets and we waited about 40 minutes in a somewhat constantly moving line. About 4:15 a lady announced that at 4:30 they would open the doors and everyone outside would be admitted for free for the event to take place about 4:38. That created a mad push to the front gates which totally destroyed any order or idea of a line. The lady then announced that those who wanted a guaranteed spot to get in (they would only let people in free up to capacity), should still stand in line for tickets. We were willing to pay for the tickets, but there was no chance of getting to the ticket counter now that a few thousand people were told that they could get in for free if they were at the front of the line at 4:30. Eventually 4:30 came and we rushed the gate with everyone else and were able to position ourselves to see the pyramid. The sun was still strong. Just a few minutes (maybe 3) before the climax of the event, a very thick cloud rolled in front of the sun. And that was the end of the show. We never saw the sun again that day. But it was cool being there and seeing what we did. They had anticipated 45,000 people at the event. Only 25,000 showed up. With a good possibility of there being no event, I understand why people stayed away. Especially the local people. We personally spent about $50 in gas and tolls to take 7 people to this world renown event, while others spent well into the thousands of dollars to enjoy it with their families. I feel worst for those who planned their whole vacation to come to Yucatán on a once in a lifetime trip to see this take place. The weather is normally very clear this time of year. We basically have no rain and few clouds from December to May. The chances of this not being seen is very rare. But it happened this year unfortunately. We still had fun. It took us well over an hour to get out of the site and the parking lot. With only 1/2 of the anticipated crowd, I can’t imagine what it would be like if they had all shown up. Well, at least you had your party with you and could visit while you waited for the non-events to take place.